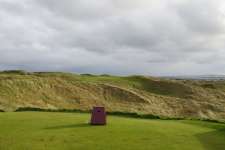 Situated on Northern Ireland’s beautiful North coast, the Royal Portrush Golf Club occupies an ancient dune system that runs alongside the Atlantic Ocean and overlooks the Giant’s Causeway headland and its towering limestone cliff edges. Founded inland of the sandhills in 1888, the club gradually shifted toward the town’s heavy coastal dunes and by 1929 had acquired enough land to build two full courses, Harry Colt employed to design them both. Presented with a rippled landscape covered in undulation, Colt decided to use the higher, more exposed, ground which was full of deep valleys, long ridges and large plateaus, to build his famous Dunluce Links and set the much underrated Valley Course among the site’s sunken sand basin. Enjoying the pick of the linksland, the Dunluce course is a masterpiece of golf architecture. The brilliance of Colt’s work is apparent in holes that beautifully follow the curvature of the sand formations and feature some of the most cleverly conceived green complexes in golf, the targets built to only accommodate those playing at the top of their game. 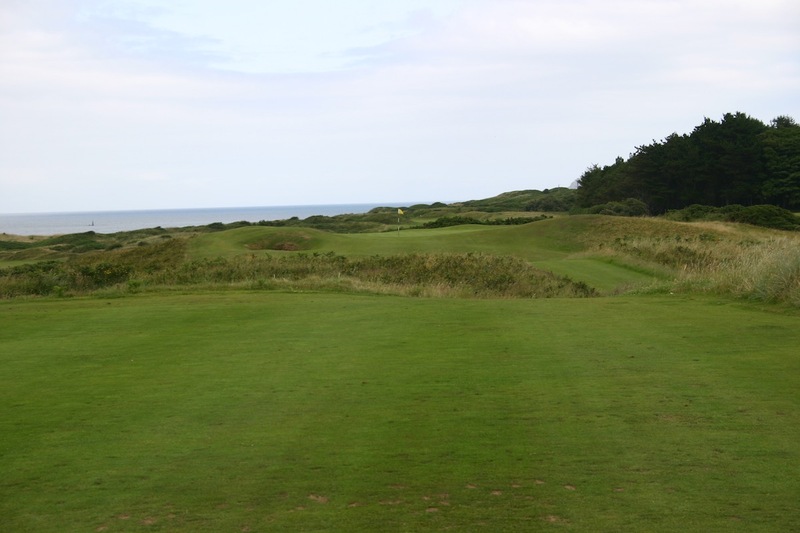 Lined by thick roughs and deadly gorse, fairways mostly nestle in natural valleys between the intimidating dunes, though Colt was also unafraid to occasionally route them across their plunging crests. For those approaching from Belfast, the Portrush experience starts with a memorable drive into town along the twisting Antrim coast road. This winding drive takes you along the Causeway cliffs and past the ruins of the ancient Dunluce castle before suddenly opening up to present the town and its magnificent links in all their seaside glory. The round itself begins with a front nine of rare quality, the uphill opening hole does little more than get you away but is followed by a seven-hole stretch as profound as any you will play. 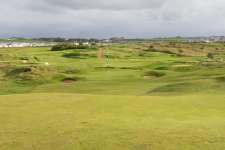 The 4th, for instance, is a cracking hole that requires strong and straight shots squeezed firstly between bunkers and an out of bounds fence and then through two small dunes guarding a superb mini-dell green. Then 5th then skims bunkerless across small ripples to a marvelous target perched right at the brink of the Portrush cliffs, while the 6th is a fabulous par three that features a large tiered green angled to reject anything not struck precisely. The next gem is Himalayas, the short par four 8th hole which bends through a gorgeous dune valley and toward a seriously slender green. Taking in the invigorating scenery from this tee with both the Himalayas and Skerries (13) in full view, the Calamity Corner (14) a few hundred yards away and memories of the opening stretch fresh in your mind, this feels like the greatest links of them all. It is probably a measure of the front nine’s greatness, therefore, that in some ways the back nine is a touch disappointing. There remains some wonderful golf, but one or two nondescript moments and the flatness of the finishing holes keeps it from reaching the dizzying heights of the opening nine. Highlights are generally concentrated on a five-hole series that starts with the strong par four 12th, its green built on a ridge that falls away cruelly on both sides and is difficult to hit unless approached directly from the middle of the fairway. The 13th is then a wild ride from a blind low tee across a large crest that opens up to present golfers with beautiful views of the Skerries islands just offshore. Next up is Portrush’s star attraction, the huge one-shot Calamity which skirts the top of a massive ridge, its entire right side collapsing violently down into a deep chasm. Of the remaining holes, the falling 15th is adventurous, though a tad extreme, while the par four 16th is an excellent test and the 18th, converted from a soft five to a stiff four, is now an appropriate conclusion to such a demanding round. 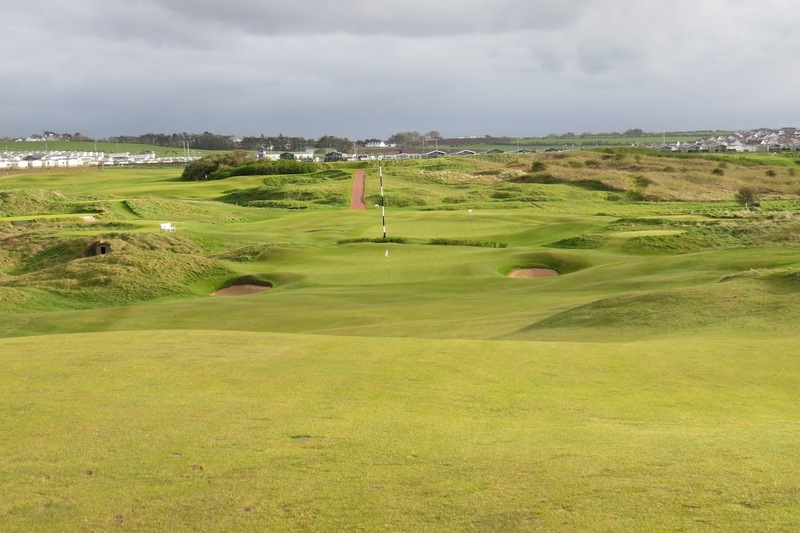 Despite some disappointment with the finish at Portrush, in truth, there are only a handful of courses more enjoyable and very few places that you will long to return to more. It is believed that Colt regarded Dunluce as his finest achievement and it is clearly the best of those layouts credited solely to him. With an inspired setting, ideal golf land, a superb design and wonderful construction, Royal Portrush is close to the perfect example of a quality links and sits comfortably among the best dozen or so golf courses on the planet.